The nearest tennis courts can be found in the German town of Kurort Oberwiesenthal. The tennis hall is near the local ski resort and summer bobsleigh track. In the tennis hall, you can use two indoor tennis courts. The surface of both indoor courts is made of high-quality velour carpets and entrance is allowed only in tennis shoes. The lighting in the hall works as a slot machine where you need coins in the value of 0.50 €. Keep in mind, therefore, to have an adequate supply. 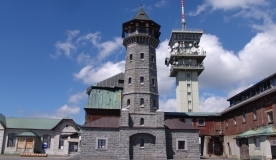 For more information, visit the information centre in Boží Dar, or the website of Tennis Hall of Oberwiesenthal.